Snow came down, and the feeder is empty. In my world, nature is quite with a blanket of gray all around. Crows and black birds seem to take over the tree tops. I see cardinals and blue jays on occasion. The bird seeds didn't last long enough for them to come by. Hungry squirrels were a bit more aggressive at this time of year. They took on residency where there are foods. Thanks for stopping over and leaving a comment. I like your shots of the snow. We finally have a sunny day and I was going out today for a shooting session but my granddaughter just called. She is coming to visit. I will enjoy that too. Funny your post is about bird feeders...I just went out an d filled mine up. Great capture of the snow laden bird feeder. The bird feeders are so important at this time of the year. We have also been asked to make sure there is water around as so many ponds etc are frozen. 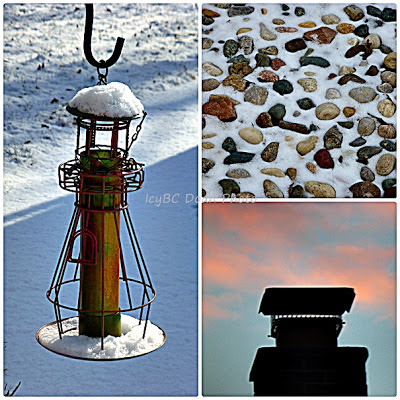 I like the photo of the pebbles in the snow. I absolutely love that second shot! Your random shots are very nice, love the stone one particularly. My bird feeders are emptied daily by the squirrels! Interesting!! Boom & Gary of the Vermilon River, Canada. lovely shots of the world around you, the quietness is outstanding.